There will be a work party at Paramount Open Space on Sunday, January 27, 2019 from 10am to 2pm to remove invasive plants and replace them with native species. The work will help maintain forest health at Paramount Open Space. Sunday, January 27, 2019 from 10am to 2pm but volunteers can arrive and leave whenever they like during the work party. Paramount Open Space. 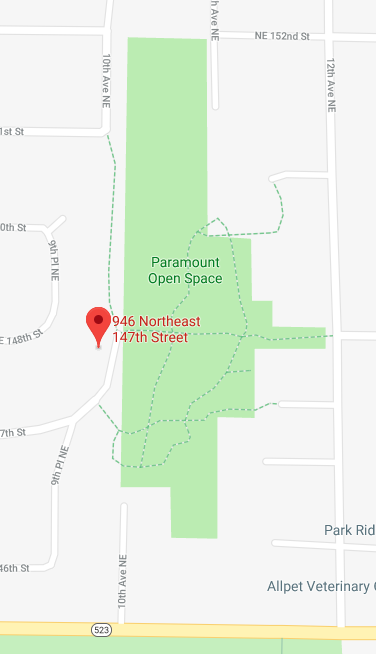 There is a public parking lot with free parking at the end of NE 147th St two blocks east of 8th Ave NE in Shoreline. The street address of the parking lot is 946 NE 147th St, Shoreline 98155. Wear warm clothes and rugged footwear that you won’t mind getting dirty. If you have garden tools (e.g., shovels, clippers, or loppers) and gloves bring those along.